From goulish ghosts to frightening fangs and party pumpkins, we’ve scoured the internet to bring you the top 10 perfect ways to decorate your kitchen space along with seasonal food and drink to serve to ensure a Halloween party to remember! Be the hostess with the mostess & serve a tangy treat on arrival. In a mixing glass, combine 1½ parts Absolut Madrin, ½ part Malibu, 1 part passion fruit puree, ½ part white grapefruit juice, ¾ part cinnamon schnapps, and 2 dashes Perno Absinthe. Pour over crushed ice in a clear glass. Top with ½ part Cappalletti along with a few plastic spiders for added effect! 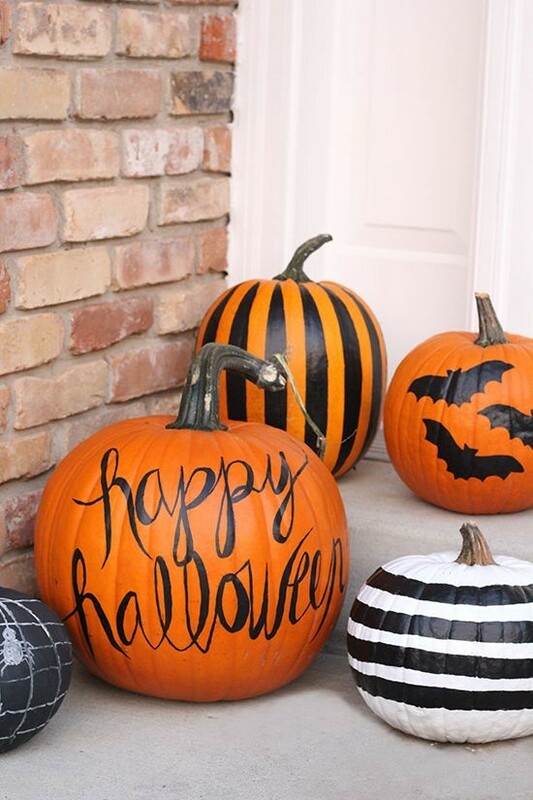 According to Pinterest, carving is so last year! The latest trend is all about embracing the beauty of the pumpkin and actually using the surface to create your own unique design. These party pumpkins would look fabulous grouped together by your kitchen door or scattered along your kitchen worktop or island unit. We’ve found a fabulous way to dress your kitchen table and an easy one too! 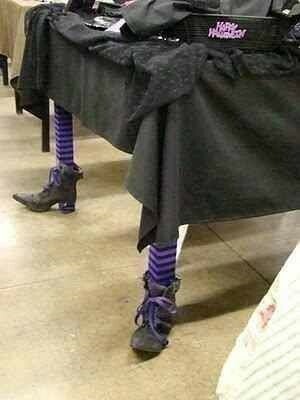 A pair of bold coloured stripy tights on the legs of your table coupled with an old pair of boots and a plain black sheet as a table cloth will give your kitchen an eerie effect. Hanging decorations will work a treat from your kitchen ceiling. We’ve found some cool ones on www.partydelights.co.uk and all at a reasonable price too! We’ve found the perfect prop! 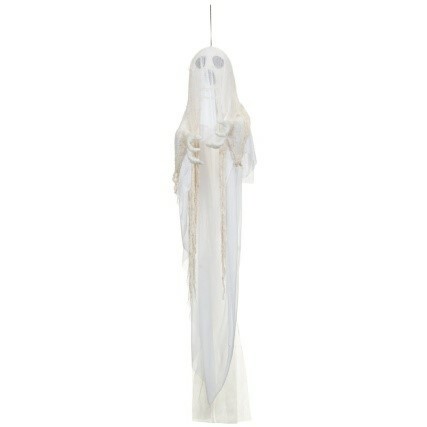 This animated hanging ghost is the perfect addition to any Halloween party, featuring a flashing head & hands and spooky wailing noises with sound activation. This would be perfect hanging from your kitchen light or even on the back of your kitchen door. 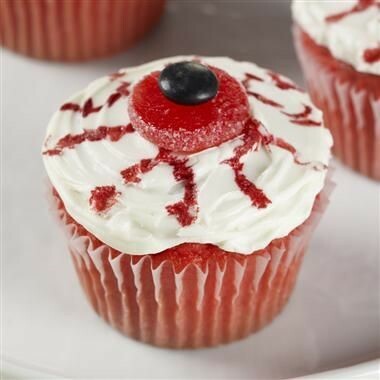 If you’re handy in the kitchen when it comes to baking buns, why not create your own bloodshot cupcakes? With a few simple ring shaped red gummy sweets and some black m and m’s or smarties, you can transform a simple frosted cupcake into something spooky! A toothpick dipped in red food colouring and dragged across the frosting finishes it off nicely to give that bloodshot effect! 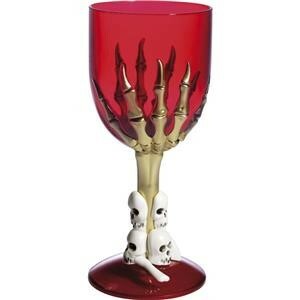 Celebrate all your fears & cheers with these frightful glasses featuring a pair of golden skeleton hands and skull decorated stem! Perfect for serving your Zombie Apocalypse cocktail from too! 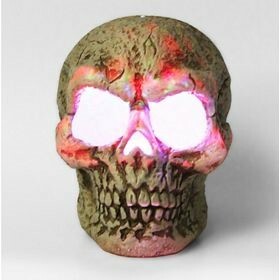 Create some atmospheric, dimmed lighting in your kitchen with Halloween themed lanterns from TK Maxx. 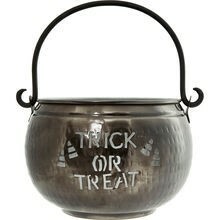 Why not stick with the theme while you’re serving up a fright! 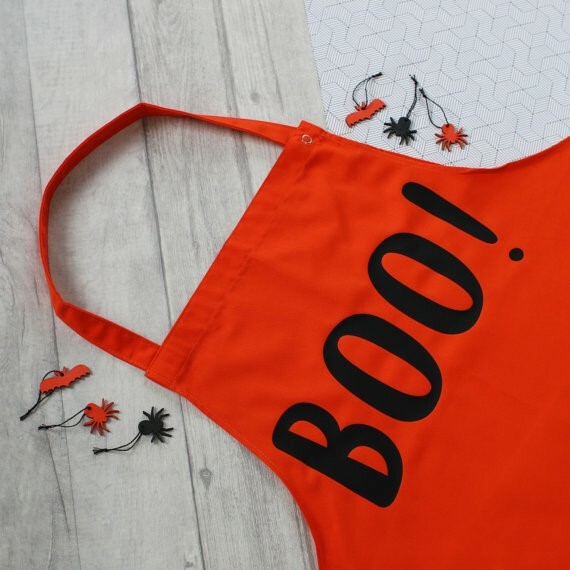 Pouring the drinks or just baking some Halloween treats, we’ve found some kitchen aprons available in a variety of colours from Etsy.com and they can even be personalised if you want something extra special!